NEW YORK, Sept. 20, 2018 (GLOBE NEWSWIRE) -- Consolidated Edison, Inc. (NYSE: ED) (“Con Edison”) today announced that one of its subsidiaries has agreed to acquire a Sempra Energy subsidiary that owns 981 megawatts (MW) AC of operating renewable electric production projects, including its 379 MW AC share of projects that it owns jointly with Con Edison subsidiaries, and certain development rights for additional solar electric production and energy storage projects. The purchase price for the acquisition is $1.54 billion (subject to closing adjustments, including working capital). The projects have $576 million of existing project debt. The acquisition is expected to be completed near the end of 2018. 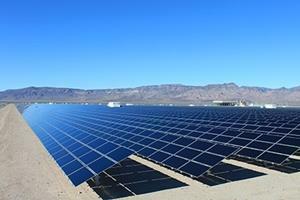 The acquisition will increase Con Edison’s utility-scale, renewable energy production portfolio to approximately 2,600 MW AC, of which 85 percent is solar and 15 percent is wind. The energy produced will avoid approximately 5.4 million metric tons of carbon dioxide emissions annually. That result is the equivalent of taking 1.2 million vehicles off the roads. The projects are located in Nevada, Arizona, California, and Nebraska, and consist of projects jointly-owned by Con Edison subsidiaries and Sempra subsidiaries and projects wholly-owned by Sempra subsidiaries. All of the existing projects sell electricity under long-term agreements with investment-grade utilities or municipalities. The sale is subject to customary closing conditions and consents, including approvals by the Federal Energy Regulatory Commission and the U.S. Department of Energy, and the expiration or early termination of the waiting period under the Hart-Scott-Rodino Antitrust Improvements Act. Con Edison expects to finance the purchase price for the acquisition with a combination of $715 million of equity and $825 million of long-term, non-recourse debt. Assuming that the acquisition closes in 2018, Con Edison estimates that the effect of the acquisition on GAAP earnings will be: accretive in 2018 (approximately $0.50 per share), due primarily to purchase accounting adjustments; dilutive in 2019 (approximately $0.25 per share) and 2020 (approximately $0.15 per share), due primarily to accounting for existing third-party tax equity investments in certain of the projects being acquired; and accretive thereafter. For the year of 2018, Con Edison reaffirms its previous forecast of adjusted earnings per share of $4.15 to $4.35 per share. Adjusted earnings per share exclude purchase accounting adjustments for the acquisition. Citi served as lead financial advisor to Con Edison and has also provided committed bridge financing to support the acquisition. CCA Group, LLC also acted as a financial advisor. Troutman Sanders LLP served as Con Edison’s legal advisor. A slide presentation regarding the acquisition will be available at www.conedison.com (select “For Investors” and then select “Press Releases”). This news release contains forward-looking statements that are intended to qualify for the safe-harbor provisions of Section 27A of the Securities Act of 1933, as amended, and Section 21E of the Securities Exchange Act of 1934, as amended. The words “expects,” “believes,” anticipates,” “intends,” “plans,” “will,” “shall,” “estimates,” and similar expressions identify forward-looking statements, which are statements of future expectations and not facts. Forward-looking statements reflect information available and assumptions at the time the statements are made, and speak only as of that time. Actual results may differ materially from those included in the forward-looking statements because of various factors such as when the acquisition is completed, if at all, and those factors identified in reports Con Edison has filed with the Securities and Exchange Commission, including that the company’s subsidiaries are extensively regulated and are subject to penalties; its utility subsidiaries’ rate plans may not provide a reasonable return; it may be adversely affected by changes to the utility subsidiaries’ rate plans; the intentional misconduct of employees or contractors could adversely affect it; the failure of, or damage to, its subsidiaries’ facilities could adversely affect it; a cyber-attack could adversely affect it; it is exposed to risks from the environmental consequences of its subsidiaries’ operations; a disruption in the wholesale energy markets or failure by an energy supplier could adversely affect it; it has substantial unfunded pension and other postretirement benefit liabilities; its ability to pay dividends or interest depends on dividends from its subsidiaries; it requires access to capital markets to satisfy funding requirements; changes to tax laws could adversely affect it; its strategies may not be effective to address changes in the external business environment; and it also faces other risks that are beyond its control. Con Edison assumes no obligation to update forward-looking statements. This press release also contains a financial measure, adjusted earnings, which is not determined in accordance with generally accepted accounting principles in the United States of America (GAAP). This non-GAAP financial measure should not be considered as an alternative to net income, which is an indicator of financial performance determined in accordance with GAAP. Adjusted earnings excludes from net income certain items that the company does not consider indicative of its ongoing financial performance. Management uses this non-GAAP financial measure to facilitate the analysis of the company's financial performance as compared to its internal budgets and previous financial results. Management also uses this non-GAAP financial measure to communicate to investors and others the company’s expectations regarding its future earnings and dividends on its common stock. Management believes that this non-GAAP financial measure is also useful and meaningful to investors to facilitate their analysis of the company's financial performance. Consolidated Edison Development, Inc. is a wholly-owned subsidiary of Con Edison Clean Energy Businesses, Inc. that acquires, develops, builds and operates wind and solar electric generation facilities across the U.S. The portfolio includes renewable energy, as well as energy storage assets. Con Edison Development’s wind and solar assets total 1,600 MW AC across 17 states. The power produced by these projects is primarily sold through long-term contracts to utilities, electric cooperatives, municipalities, and commercial and industrial customers. Con Edison Clean Energy Businesses, Inc. is a wholly-owned subsidiary of Consolidated Edison, Inc. Con Edison Clean Energy Businesses, Inc., through its three main subsidiaries, develops, owns, and operates renewable and energy infrastructure assets and provides energy-related products and services to wholesale and retail customers. Consolidated Edison, Inc. is one of the nation's largest investor-owned energy-delivery companies, with approximately $12 billion in annual revenues and $49 billion in assets. The company provides a wide range of energy-related products and services to its customers through the following subsidiaries: Consolidated Edison Company of New York, Inc., a regulated utility providing electric, gas and steam service in New York City and Westchester County, New York; Orange and Rockland Utilities, Inc., a regulated utility serving customers in a 1,300-square-mile-area in southeastern New York State and northern New Jersey; Con Edison Clean Energy Businesses, Inc., which through its three main subsidiaries develops, owns and operates renewable and energy infrastructure projects and provides energy-related products and services to wholesale and retail customers; and Con Edison Transmission, Inc., which through its subsidiaries invests in electric and natural gas transmission projects.